The Dust Collector (Figure 25-1) provides an efficient and effective means to collect wood shavings and sawdust from your workshop. Unlike conventional shop vacuums, the Dust Collector is designed to collect and filter the large volume of dust and shavings produced by modern woodworking equipment. When used in conjunction with efficient dust collection chutes and attachments, the Dust Collector will help you approach dust-free woodworking. The heart of the Dust Collector is a large industrial blower which moves large volumes of air. Sawdust and wood shavings pass through the blower, slow down, and then settle in the disposable bag. The air returns to the room after passing through a large, permanent filter capable of capturing even the smallest wood dust particles. When you put your hand over the end of the Dust Collector hose you will not feel the high vacuum, or sealed suction, of a home or shop vacuum. A home vacuum cleaner needs this sealed suction to move air through small openings. 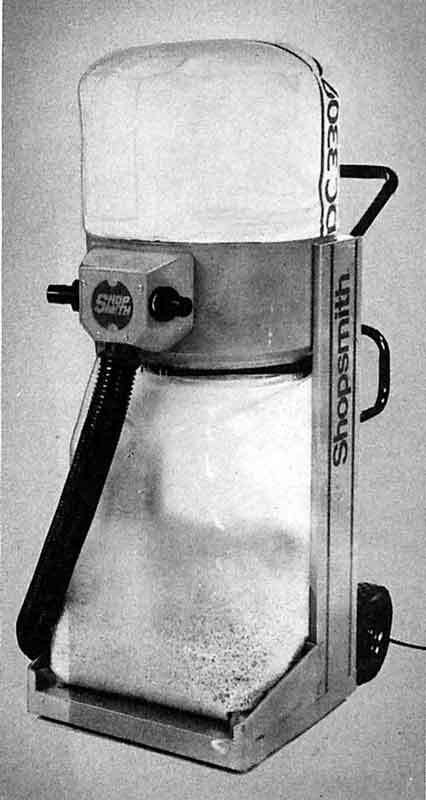 A typical shop vacuum also requires a high sealed suction when used for water pickup. The large airflow of the Dust Collector can be felt by placing a few fingers into the end of the hose. The airflow of the Dust Collector is much higher than any home or shop vacuum. Figure 25-2. 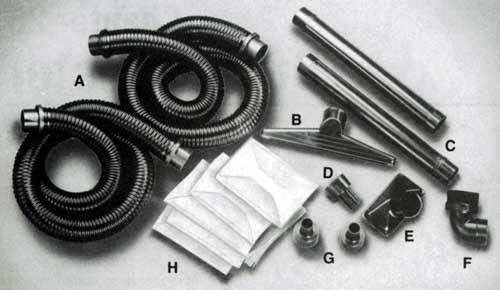 The standard accessories for the Dust Collector are: (A) two 2-1/2" x 8' flexible pickup hoses, (B) floor nozzle, (C) two extension wands, (D) 2-1/2" to 1-1/4" reducer, (E) utility nozzle, (F) elbow brush, (G) two inlet plugs, (H) six 30-gallon waste disposal bags, and two inlet plug caps (not shown). Use the standard accessories or your choice of optional accessories shown in Figures 25-2 and 25-3 for dust collection operations. To assemble your Dust Collector, follow the instructions in the Owners Manual that came with your unit. Also, pay special attention to the electrical requirements listed in the manual. Figure 25-3. Some optional accessories for the Dust Collector are: (B) 24" Filter Hood, (C) Bandsaw Dust Chute, (D) 2-1/2" Hose Connector (coupler), (E) 2-1/2" Elbow, (F) Six 30-gallon waste disposal bags, and (G) Remote Foot Switch and 4" inlet assembly (not shown). The large airflow and filter capacity make it suitable for other dust producing activities such as drywall sanding (Figure 25-4). Through use, you'll discover more. The heavy polyester/felt filter hood filters out sawdust particles from the air and returns virtually dust-free air to the room. The standard seven square feet of filter area allows the Dust Collector to move air at normally 330 cubic feet per minute (cfm). A choice of hook-ups gives you greater versatility. For portable operation using the standard 3-way inlet, you can connect one 2-1/2" diameter hose or use two or three hoses simultaneously. For equipment that has a 4" dust chute or for a permanent piping dust collection system, an optional 4" inlet assembly can be substituted. Its elbow can be set at four different positions 90-degrees apart. Figure 25-4. Use your Dust Collector for other dust producing activities such as drywall sanding. The powerful 1/2 hp motor is enclosed to keep out harmful dust particles, is fan cooled, and has no brushes to wear out. The large 4-vane fan creates maximum airflow to eliminate the settling of debris in the hoses. 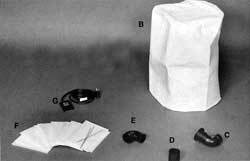 The heavy duty, see-through collection bag has a 30 gallon capacity and is 4 mils thick. A quickrelease strap and bag retainer clips make changeovers a one person job. The oversize wheels and casters provide easy mobility while making the Dust Collector relatively tip-proof. - The durable and kink-resistant flexible hoses attach to stationary or hand-held power woodworking equipment having 2-1/4" dust chutes. - The reducer allows you to connect equipment with 1-1/4" chutes found on older models of the Mark V Model 500 and Belt Sander. - The two extension wands eliminate back bending for floor cleanup. - The floor nozzle has a built-in brush and roller wheels for quick and easy floor work. - The utility nozzle is designed for bench top cleaning and for tight spots where the floor nozzle is too big. - The elbow brush can be used for sweeping shelves, walls, equipment, or workpieces. - The hose rack, on which you can neatly store your hoses, including extras. - The 4" Inlet Assembly, used to build a permanent dust collection piping system (described later in this chapter). - The extra large 24" filter hood has twice the capacity as the standard filter hood, allowing twice as much time between cleanings. - The remote foot switch give you convenient and complete control of the Dust Collector. Uncontrolled sawdust can be both a nuisance and a hazard -- especially the potential health hazard of breathing sawdust. Because this involves even the most common woods, you should be particularly aware of woods that are known to be toxic. For your safety, please refer to the list of toxic woods and the reactions they may cause (Table 25-1 below). Not everyone is sensitive to these woods, but you should still be very careful when working with them. NOTE: This table has been reprinted from Fine Woodworking Magazine, copyright 1983. The taunton Press, Inc., 63 South Main Street, Box 355, Newtown, CT 06470. Ground the Dust Collector. The Dust Collector comes equipped with an approved 3-conductor cord and a 3-prong grounding type plug to fit the proper grounding type receptacle. The green conductor in the cord is the grounding wire. Never connect the green wire to a live terminal. Avoid dangerous environments. Electric shock could occur if the Dust Collector is used on wet surfaces. Do not expose it to rain, snow or wet floors. Store it indoors. Do not operate the Dust Collector without the 3-way inlet or the 4" inlet assembly securely mounted in place. The powerful suction can actually pull body parts into the intake opening and cause contact with the motor fan. Do not pick up water or wet materials with the Dust Collector. Position the hose(s) out of the way so you won't trip over them. Do not pick up hot or burning materials such as cigarettes and ashes. They could ignite a fire in the bag. These materials should be properly disposed of in a fire-proof container. Do not attach the Dust Collector to a tool used for metal grinding or sharpening. Sparks generated during grinding could ignite dust and shavings inside the bag. They may also damage the hose and the fittings. 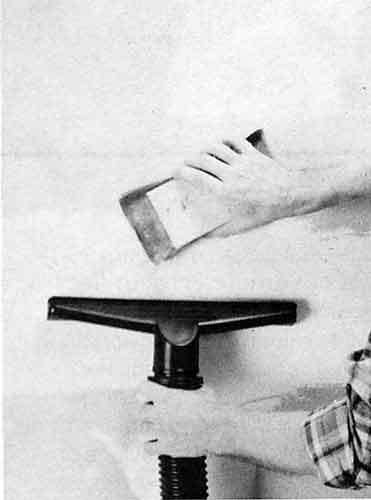 Do not reach across a power tool to turn off the Dust Collector. Turn off the power tool and then go around to the Dust Collector and turn it off. Do not force the Dust Collector to do a job for which it was not designed. Check damaged parts. A damaged part should be properly repaired or replaced before further use. If a strange noise or vibration develops, immediately turn off the power, unplug the Dust Collector and correct the problem. Avoid unintentional starting. Make sure the switch is in the Off position before plugging in or unplugging the Dust Collector. Turn off and unplug the Dust Collector before changing bags and performing maintenance or service. Do not stand or lean on the Dust Collector. You could fall onto it, or it could tip over, injuring you and/or damaging the Dust Collector. Use only recommended Shopsmith replacement parts and accessories on your Dust Collector. NEVER use nonShopsmith replacement parts or accessories. Using nonShopsmith parts may cause a hazardous condition and will void your warranty. Do not leave the Dust Collector running unattended. Do not drag the cord across sharp tools or edges which could damage the cord. Do not try to move or unplug the Dust Collector by pulling on the cord. NOTE: Static electrical discharge sometimes builds up on the Dust Collector, hoses and wands. It is rarely a safety problem, but it can give you an unpleasant sting--especially when you're not expecting it while using the Dust Collector. When the Dust Collector is operating under dry conditions (dry air and/or dry wood), static electricity can build up in the flexible hose(s). To keep static electricity to a minimum, before and during vacuuming, maintain hand contact with a metal surface of the nearest turned off machine. Position the Dust Collector conveniently near the power equipment. Connect the hose(s) to the 3-way inlet and to the dust chute(s) on power equipment. See Figure 25-5 for the various hose connection points. Push the plug caps onto the inlet plugs. Then place an inlet plug assembly in any inlet not being used. These plugs help to muffle noise and slightly increase the suction power. If you desire, you can leave inlets open to help filter dust from the air. Remember that all materials picked up pass through the blower. While the fan will not be damaged by small scraps which you may occasionally pick up, don't make a practice of picking up scraps. They will pass through the fan and be struck at high velocity by the fan blades and flung against the blower fan housing with a loud noise. In some instances, large scraps could even become jammed in the fan. When the Dust Collector is attached to woodworking equipment by the hoses, there is no occasion for large scraps to be sucked into the blower. However, when sweeping the floor and cleaning up, pick up large wood scraps before you use the dust collector. Caution: Do not sweep into the Dust Collector scraps or solid objects the ske (or larger) of those shown below. They may damage or jam the fan. For some workshops, it may be more convenient to install permanent piping rather than to move the Dust Collector to various locations throughout the shop. The optional 4" inlet assembly is the link to a permanent installation. It replaces the 3-way inlet of the Dust Coliector to connect to a permanent piping system along the walls of your workshop. With a permanent setup using PVC (polyvinyl chloride) pipes and 2-1/2" diameter flexible hoses, you can conveniently work with as many as three machines in succession without moving the Dust Collector or changing hose connections. Warning: Turn off and unplug the Dust Collector. Remove the cover plate and 3-way inlet from the Dust Collector. Attach the 4" inlet assembly with the four screws that attach the 3-way inlet. The elbow of the inlet assembly can be set at four positions 90-degrees apart. If necessary to change the position of the elbow, take out its two attaching screws. Turn the elbow to the desired position, making sure that the mounting holes of the elbow and inlet line up. Reinstall the two screws securely. In planning a permanent system, keep in mind that long lengths of flexible hose will reduce airflow. Also, smooth piping causes much less resistance to airflow and is strongly recommended for the main collection line of your system. Rigid PVC pipe and various fittings are available at most home centers or plumbing supply distributors, and are best suited for permanent systems. Figure 25-6. Suggested permanent piping system (overhead view). Click on image for larger view. Make your system simple, compact and efficient. Avoid long runs, sharp turns and restrictions. - Two 90-degree elbows (including the 4" inlet assembly). Elbows reduce airflow. So, for each additional elbow used, you should reduce the overall length of your system. Refer to the chart below to determine the amount of piping reduction recommended for the addition of certain fittings. - One 4" dia. x 8' long flexible hose from Dust Collector (not available through Shopsmith). This will make it more convenient when changing bags or moving the Dust Coilector. However, it will reduce airflow slightly. - Three 2-1/2" dia. x 8' long flexible hoses to connect to machinery. If you're planning a system that will connect more than three machines, have provisions for plugging or switching the hoses. Only connect three hoses at a time. Failure to do this would cause the machine at the end of the line to have insufficient airflow, with too little suction to remove sawdust from the machine. Use Schedule 10 (thin wall) PVC pipe and fittings. If Schedule 10 plumbing is not available, thicker walled pipe and fittings (higher Schedule number such as 40 or 60) may be used. However, because of the resulting differences in diameters, the flexible hose and piping connections will have to be taped securely with duct tape to prevent reduced airflow due to leakage. 1. Make a 4" diameter wooden disc on a bandsaw (see illustration for the range of thicknesses). 2. Drill a hole 2-1/4" through the center of the disc. 3. Disc sand the outer circumference of the wooden disc to get a slight taper. 90-degree elbows should be used only where absolutely necessary. Long sweep elbows are recommended. Do not use 90-degree tees in place of the Y fittings. Mount the PVC piping on your shop walls at the same height as the inlet of the Dust Collector. Use nylon straps and screws, wire and screws, or L-brackets, screws and wire to support the pipe. Place supports at each fitting or every 4 feet, whichever is closer. Limit the length of flexible hoses. Locate equipment which produces high volumes of chips and sawdust closest to the Dust Collector. Plug or cap unused openings, but keep at least two 2-1/2" openings in use at all times to ensure sufficient airflow in 4" pipe sections. Use duct tape, PVC cement or silicone around all permanent joints to prevent air leakage. During operation, dust will build up on the inside surface of the filter hood. After every 8 to 10 hours of Dust Collector operation, vacuum the exterior of the filter hood. Just before you change the collection bag, tap the top and sides of the filter hood to dislodge the dust buildup. If you're generating a lot of fine dust, tap off the dust buildup more often. After every 15 to 30 hours of operation, wash the filter hood to maintain optimum performance. Before washing, dislodge the dust buildup and remove the retaining strap. Then, hand or machine wash the hood in cold water using a mild detergent. Line dry or tumble dry on no heat. When the hood is dry, reinstall the retaining strap assembly. When cleaning up and before you open the door(s) of your shop to adjaent rooms, use the Dust Collector to remove the remaining airborn sawdust. If your Dust Collector is portable, use one hose for vacuuming, with the remaining two inlets open to pull in the dusty air. If you have a permanent piping system, disconnect the flexible hoses from the equipment and then turn on the Dust Collector. How long it takes depends on the size of your workshop and the amount of airborne sawdust.